8 students max. Pre-registration only. 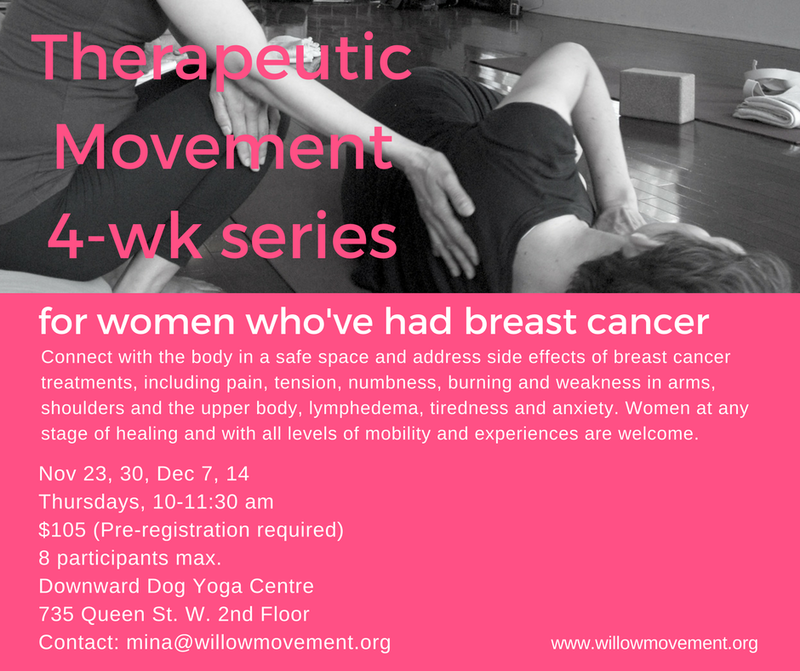 To register, email: mina@willowmovement.org or call 647 892 3404. Learning to listen to your body is an empowering and effective way to address the side effects of breast cancer treatments, including pain, tightness, numbness and burning sensations in arms, shoulders and the upper body, lymphedema, tiredness, anxiety and muscle weakness. In a safe space of a small group setting, reconnect with the body through movement, breath, and stillness. Mina will assess each individual's movement patterns and customize the content to fit the uniqueness of each person. Come join her to experience your wholeness. Women at any stage of healing and with all levels of mobility and experiences are welcome.